The American Cancer Society estimates that around 42,000 new cases of primary liver cancer and intrahepatic bile duct cancer will be diagnosed in the United States this year. Unfortunately, liver cancer incidence has more than tripled since 1980. However, rates in young adults have recently begun to decline. Liver cancer death rates have increased by almost 3% per year since 2000. Liver cancer is seen more often in men than in women. Several types of cancer can form in the liver. The most common type of liver cancer is hepatocellular carcinoma, which begins in the main type of liver cell (hepatocyte). Other types of liver cancer, such as intrahepatic cholangiocarcinoma and hepatoblastoma, are much less common. Not all cancers that affect the liver are considered liver cancer. Cancer that begins in another area of the body — such as the colon, lung or breast — and then spreads to the liver is called metastatic cancer rather than liver cancer. And this type of cancer is named after the organ in which it began — such as metastatic colon cancer to describe cancer that begins in the colon and spreads to the liver. Cancer that spreads to the liver is more common than cancer that begins in the liver cells. Hepatocellular carcinoma (HCC) is the most common type of primary liver cancer. Hepatocellular carcinoma occurs most often in people with chronic liver diseases, such as cirrhosis caused by hepatitis B or hepatitis C infection. Blood tests. Blood tests may reveal liver function abnormalities. Imaging tests. Your doctor may recommend imaging tests, such as an ultrasound, computerized tomography (CT) scan and magnetic resonance imaging (MRI). Removing a sample of liver tissue for testing. Your doctor may recommend removing a piece of liver tissue for laboratory testing in order to make a definitive diagnosis of liver cancer. During a liver biopsy, your doctor inserts a thin needle through your skin and into your liver to obtain a tissue sample. In the lab, doctors examine the tissue under a microscope to look for cancer cells. Liver biopsy carries a risk of bleeding, bruising and infection. Once liver cancer is diagnosed, your doctor will work to determine the extent (stage) of the cancer. Staging tests help determine the size and location of cancer and whether it has spread. Imaging tests used to stage liver cancer include CTs, MRIs and bone scans. There are different methods of staging liver cancer. One method uses Roman numerals I through IV, and another uses letters A through D. Your doctor uses your cancer’s stage to determine your treatment options and your prognosis. Stage IV and stage D indicate the most advanced liver cancer with the worst prognosis. Make an appointment with your doctor if you experience any signs or symptoms that worry you. Treatments for primary liver cancer depend on the extent (stage) of the disease as well as your age, overall health and personal preferences. Surgery to remove the tumor. In certain situations, your doctor may recommend an operation to remove the liver cancer and a small portion of healthy liver tissue that surrounds it if your tumor is small and your liver function is good. Whether this is an option for you also depends on the location of your cancer within the liver, how well your liver functions and your overall health. Liver transplant surgery. During liver transplant surgery, your diseased liver is removed and replaced with a healthy liver from a donor. Liver transplant surgery is only an option for a small percentage of people with early-stage liver cancer. Heating cancer cells. In a procedure called radiofrequency ablation, electric current is used to heat and destroy cancer cells. Using an ultrasound or CT scan as a guide, your surgeon inserts one or more thin needles into small incisions in your abdomen. When the needles reach the tumor, they’re heated with an electric current, destroying the cancer cells. Freezing cancer cells. Cryoablation uses extreme cold to destroy cancer cells. During the procedure, your doctor places an instrument (cryoprobe) containing liquid nitrogen directly onto liver tumors. Ultrasound images are used to guide the cryoprobe and monitor the freezing of the cells. Injecting alcohol into the tumor. During alcohol injection, pure alcohol is injected directly into tumors, either through the skin or during an operation. Alcohol causes the tumor cells to die. Injecting chemotherapy drugs into the liver. Chemoembolization is a type of chemotherapy treatment that supplies strong anti-cancer drugs directly to the liver. Placing beads filled with radiation in the liver. Tiny spheres that contain radiation may be placed directly in the liver where they can deliver radiation directly to the tumor. Radiation therapy: This treatment uses high-powered energy from sources such as X-rays and protons to destroy cancer cells and shrink tumors. Doctors carefully direct the energy to the liver, while sparing the surrounding healthy tissue. During external beam radiation therapy treatment, you lie on a table and a machine directs the energy beams at a precise point on your body. A specialized type of radiation therapy, called stereotactic radiosurgery, involves focusing many beams of radiation simultaneously at one point in your body. Palliative Care: Palliative care is specialized medical care that focuses on providing relief from pain and other symptoms of a serious illness. Palliative care specialists work with you, your family and your other doctors to provide an extra layer of support that complements your ongoing care. Palliative care can be used while undergoing other aggressive treatments, such as surgery, chemotherapy or radiation therapy. When palliative care is used along with all of the other appropriate treatments, people with cancer may feel better and live longer. Palliative care is provided by our skilled team of doctors, nurses and specially trained professionals, aimed at improving the quality of life for people with cancer and their families. This form of care is offered alongside curative or other treatments you may be receiving. Learn more about San Cristóbal Palliative Care. 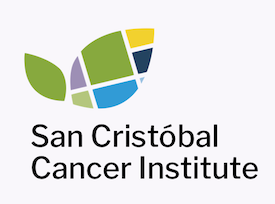 San Cristobal Cancer Institute offers a wide array of options to help our patients feel calm and supported during the process of screening, diagnosis and treatment, as well as getting back to life after cancer. Browse our alternatives for patients – including financial aid for those eligible – in our Patient Resources section. If you’d like to learn more about Liver Cancer through our San Cristóbal Education Resources, attend our events or learn about our Cancer Center, please contact us. Education is one of our strongest tools at San Cristóbal Cancer Institute, empowering patients and their families with complete and updated information about more than a dozen types of cancer and providing first-hand knowledge through our dedicated team of cancer experts. If you’d like to know more, please get in touch with us. We look forward to offering you and your family powerful cancer awareness and the most comprehensive care.